This penthouse apartment is located just a few minutes walk from the beach in a quiet and peaceful location. The property has two bedrooms, one with a double bed and one with twin beds, and two bathrooms, The penthouse is tastefully furnished with high quality furniture. The lounge has a settee, 32' flat screen TV receiving UK TV channels, pay per view sports channels and more including an online film and box set library. Free WI-FI internet which is unlimited is included. The kitchen is fully equipped, including Microwave, fridge/freezer, oven and hob, toaster and washing machine/dryer and coffee maker. There is a full itinerary of cutlery, crockery and cooking utensils. The penthouse also benefits from a private spacious roof terrace with views to the sea and mountains and has the luxury of its own private plunge pool, a built in BBQ and is equipped with sun loungers, table and chairs. For those using a car, there is secure parking. There is also lift access to the apartment. My wife, Mandy and I (Andy) have been married for 39 years and live in Essex. We have two boys, both now married and we have 5 grandchildren. Mandy is originally from Grimsby and I have always lived around London. we purchased our property in Vera Playa in 2008 and chose it because of the quietness of the area and that it was not like the hustle and bustle of the likes of the Costa Del Sol. But what sold us on it totally was it's position so close to the sea and the roof terrace where, when we can go there, spend as long as possible taking in the sun all day, enjoying the pool and wining and dining there. Unique benefits of this property are the roof terrace with the private pool and BBQ, Uninterrupted sun for as long as it is in the sky. And if you get bored with that, there is the beach a few hundred yards away with 3 beach bars. The property has WI-FI Internet which is included in the price. in 2014, Spain lost the signal to receive most UK TV channels. We have installed an Internet box that receives thousands of TV channels including all free to air UK channels and most pay per view channels, including sports channels too. If that isn't enough it also receives thousands of movies and TV box sets. Want to read a newspaper? it gets them too. As for the property we take great pride in keeping it in good order. We want it to be a home from home (with sun). We want our guests to benefit from that too. We do all within our power to make sure our guests have a great holiday and will want to come and stay again. And many do! There is plenty of room for on-street parking but there is also access to secure underground parking. We supply the code to access. There is underground secured parking. We supply the access code to you on arrival. Unlimited WI-FI internet is included. Through this facility, you are able to watch all UK TV including pay per view sports and more including a free online movie library. Hand and bath towels are provided but not beach towels. This kitchen is fully equipped including fridge, freezer, oven and hob, microwave, toaster and washing machine. There is a full infantry of cutlery, plates bowls etc. and cooking utensils. We have satellite TV but UK TV channels are only available through the internet as in 2014 Spain lost the availability to watch UK TV via Satellite. The roof terrace has a pool and sunbeds, a dining area with a table and 4 chairs for al fresco dining. Perfect for sunbathing all day but there is a shaded area to escape the sun if required. There are five golf courses in the area The nearest of which is Marina Mojacar which is a 15 minute drive away. We would be pleased to help you book tee times. There is a private pool on the roof terrace. This is available for your exclusive use. There is a very large communal pool on the complex that the property overlooks. My sons and their partners used the apartment as a base while visiting relatives in a nearby villa. They found it very clean and tidy, but it was a bit further from the beach than I had expected. Some restaurants nearby which were good, but they were a bit put off when told by the manager that the apartment was in a nudist area as this wasn't specified when booking, but it appeared to be near the nudist resort rather than in it so her comments were a bit misleading. No shops nearby, other than by car or a very long walk. Thank you for the review. I am pleased you found it clean and tidy but I am sorry you thought it was further way from the beach then you were expecting. It is only 400 metres from the beach which is what the website states. I think you may not have gone the quickest way possibly. The penthouse is definitely not on a naturist urbanisation but it is adjacent to the naturist area. Apologies for any misunderstanding with the conversation with the property manager. Within a short walk are bars and restaurants and a small supermarket. Other shops and a large supermarket are about a 10/15 minute walk. We do recommend hiring a car but it is not absolutely necessary unless you want to explore the surrounding areas. Great apartment,lovely roof terrace,nice area,will recommend to family and friends,will definitely return. Lovely apartment overall. Our arrival was not a good impression, the lady did not appear helpful at all if anything irritated that we got a bit lost and couldn’t be bothered to collect keys when we left. The roof top pool is great but could do with some anti slip tape on the tiles as is very slippy when wet. The kitchen has no storage space so gets cluttered easily. The area is lovely, great restaurants serving good food at reasonable prices. Thank you for your review Ray. I am sorry that you felt the property manager was irritated with you for being lost. This is very unusual. She does not collect keys on departure from anyone. The instructions ask for the keys to be left in the key box so that you don't have to wait for her to arrive before you leave. We are installing anti slip tape on the stairs up to the roof terrace and the pool this year. They do get slippery when wet and we make the comment in our arrival book to be aware of that. An ideal location to wind down and enjoy the beach and swimming pool. A few local bars and restaurants and a small supermarket for essentials. Great facility, super roof terrace. Car essential to get around and eating out. Was incredibly quiet as very few apartments occupied at this time of year, so many nearby commercial outlets were closed. So no riotous nights at the disco! Everything inside in good condition. We slept really well here. A fantastic holiday in a peaceful area. The property had everythign we needed and the roof terrace and private pool were a bonus. The local bars and restaurants have everything you need without having to drive but we had a car and enjoyed the surrounding towns and villages too. The meet and greet from the property manager was very informing and the directions from the owner were easy to read and the journey straight forward from Almeria. We have already booked for next year because the property is so popular it gets booked very quickly. 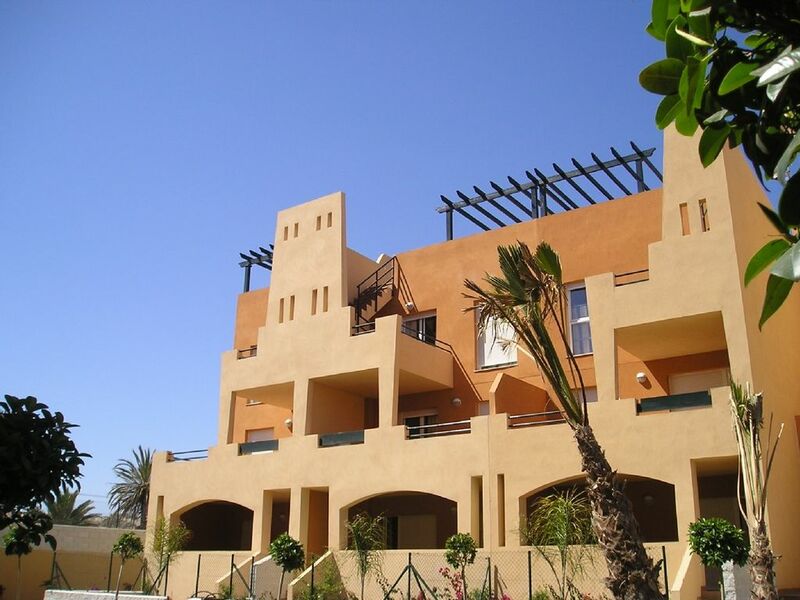 The penthouse is located just a few minutes walk from the sandy beaches of Vera Playa and the warm Mediterranean sea. There are a good selection of restaurants and bars (including 3 beach bars) within a very short walk. There is also a large supermarket. bank and a water park very close by. Within a short drive is the very pretty fishing village of Villaricos. The coastal resort and fishing town of Garrucha is a five minutes drive away and has a good selection of shops and restaurants specialising in freshly caught seafood and a cuisine to cater for all tastes. Mojácar Pueblo is 10 mins away, a pretty Spanish town set in the hillside, overlooking the coast and beautiful mountain ranges. Mojacar Playa is an excellent resort with many shops, bars and restaurants and an excellent night life too. Other Activities include Go-Karting, Bicycle hire and Sea cruises. - Prices are for the property per day/week and includes aircon, electricity, cleaning and unlimited WI-FI Internet. There are no hidden charges whatsoever. - Payment made on line by paypal or credit/debit card directly to the website.